LOA 18.28 M, LWL 18.153 M, B 5.728 M, D 4.50 M, DISPL 14,915 MT, SA 138.048 M2. espére faire le globe 2000. 2000 Europe 1 Star: inscrit, DNS. James MILLER, GB. 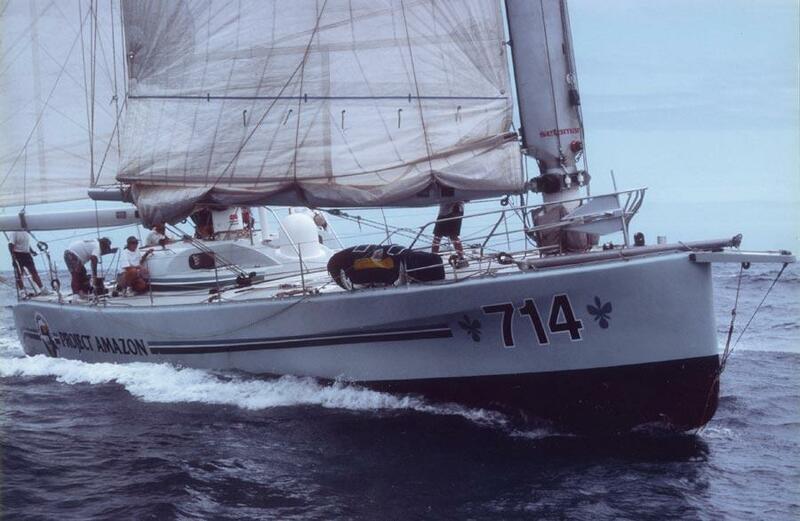 Il est inscrit "Venturer Class", ne doit pas respecter les régles IMOCA des 60' Open. Le bateau est en chantier à Boston. 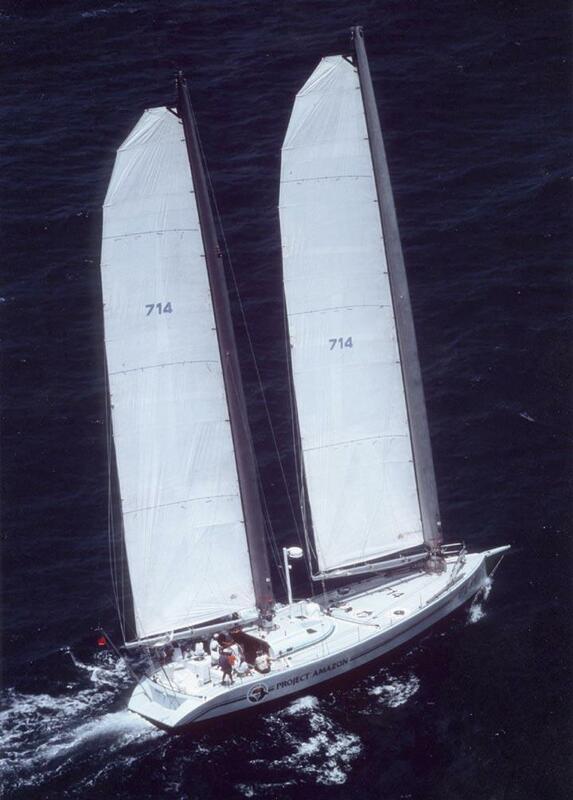 2018 Mai, From Eric W. Sponberg website: "This is probably the one boat design for which I am best known. Unfortunately, she no longer exists. 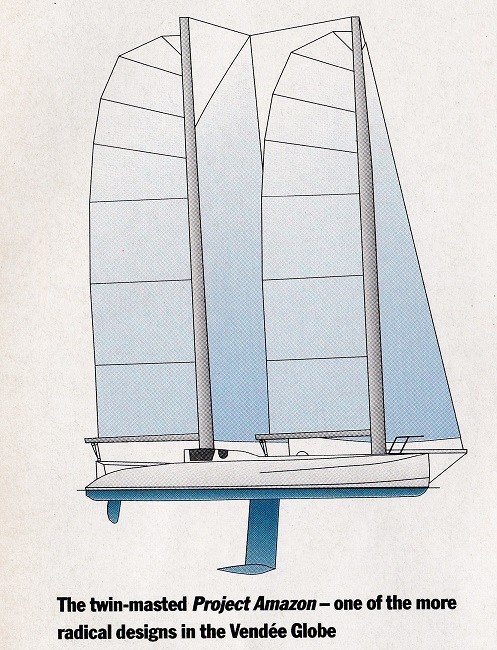 Back in 1992, I sent out a press release about a new genre of boat designs that I called The Globetrotters that got turned into a 4-page article in the German boating magazine Yacht. See The Globetrotters page on this website for more information. Sebastian Reidl, originally from Hungary but mining for gold in Quito, Ecuador, saw the article, and we started a correspondence that lead to me doing a proposal for a 60’ Vendee Globe challenger for him in aluminum. 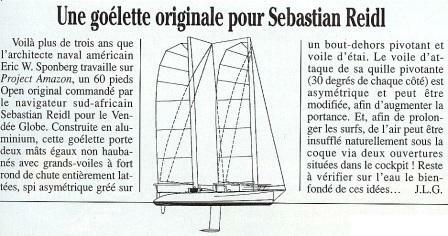 Sebastian was a machinist by trade and had built aluminum boats before. 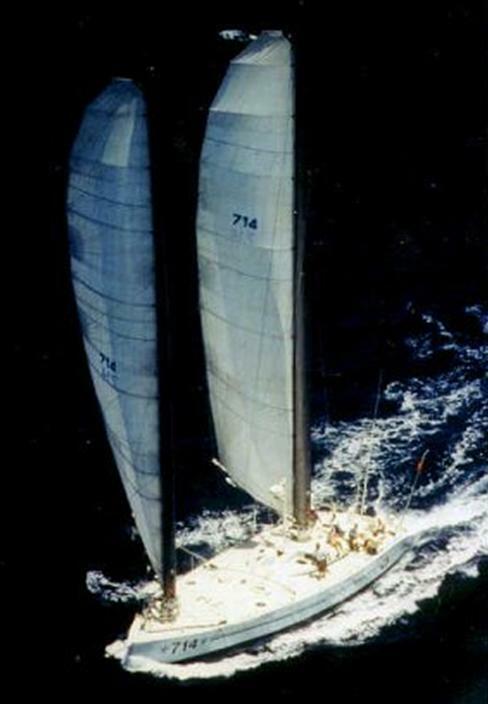 Delays of one sort or another prevented that design from continuing, but eventually, this project evolved into Project Amazon, an Open 60 Class vessel that Sebastian would race in the 1998 Around Alone Race. The funniest story about Project Amazon began during its design. Sebastian and I hired the late Lars Bergstrom of B&R Mast & Rigging to develop the air lubrication system in the bottom of Project Amazon’s hull which would draw air under the hull to reduce drag and increase speed. 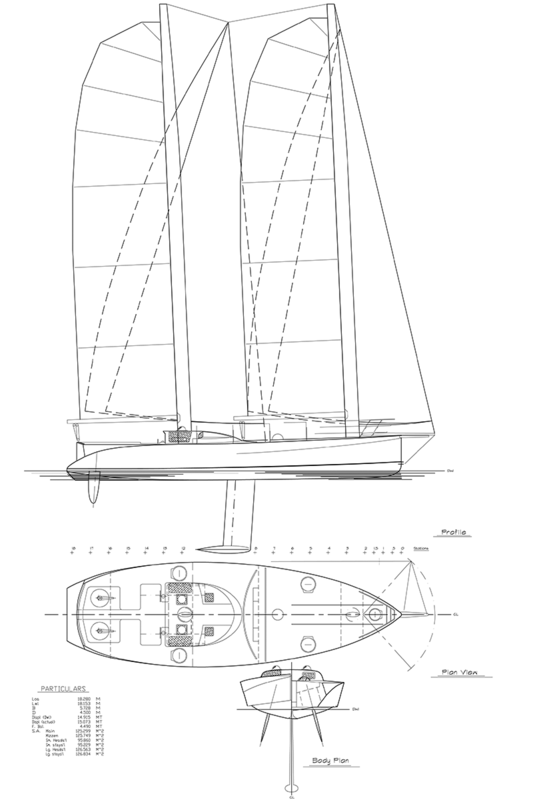 Lars had designed a similar system for Hunter’s Child, the open class 60 built and sailed by Warren Luhrs for his record-setting voyage from New York around Cape Horn to San Francisco. 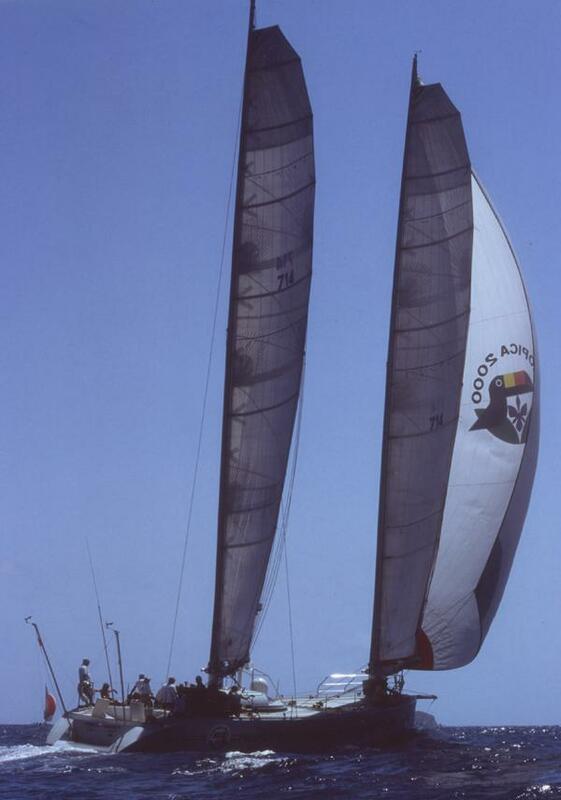 Steve Pettengill later sailed Hunter’s Child, with the air lubrication system installed, to a second-place finish in the 1994 Around Alone Race. Lars called me on the phone after he’d spec’d the lubrication system to tell me that he thought there was a problem with the boat. In his sing-song Swedish accent, he said, “Eric, I think Project Amazon is going to be too fast!” I said, “Lars, if being too fast is a problem, it is a pretty nice problem to have. That is what we are trying to accomplish.” So in January, 1998 when Sebastian was finishing his 10,000+ miles qualifying and delivery voyage from Cape Town, South Africa where Project Amazon was built, to Ft. Lauderdale, Florida, as he approached the American coast a powerful, 60+ mph wind blew off the coast and across the Gulf Stream. Sebastian and Project Amazon got pounded for a few days, and then he opted to head to Puerto Rico for refuge. As soon as he got in, he called me on the phone, and I swear, the very first words out of his mouth were, in his heavy Hungarian accent: “Ed-ic, ve have a problem vit dis boat.” I said, “Sebastian, what kind of problem?” He said, “It’s too fast!” He said, “She always goes 25 knots. Sometimes you don’t vant to go 25 knots, you only vant to go 12 knots. But she just up and goes anyvay!” Project Amazon was eventually sold to another competitor in that race (who also did not finish) who tried to get it ready for the 2002 edition of the Around Alone Race. But that person was also strapped for cash and he never made it to the starting line. Eventually, Project Amazon, now called Tin Can (gag!) was relegated to a boatyard near Baltimore, MD. 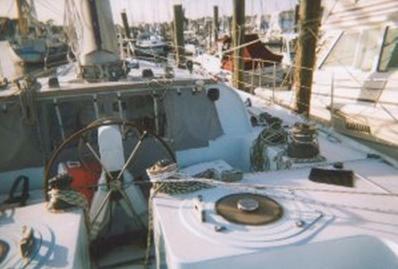 Over the next 10 years, various people were interested in buying it, mostly for cruising or charter purposes which would have required extensive modifications to the boat. No deal was ever struck, so the owner eventually scrapped the boat in 2011 for the metal and equipment on board. "